Sunday, 07th September 2008, saw my début in a DBMM competition. 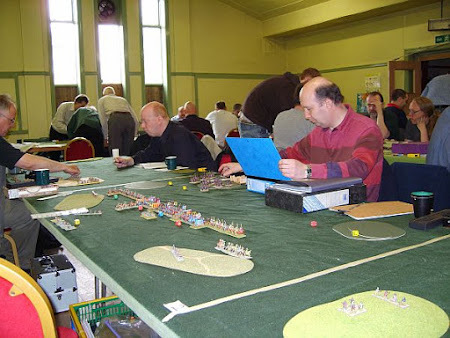 My regular opponent and I had decided that our befuddlement had declined enough to allow us to venture in to the world of competition wargaming. 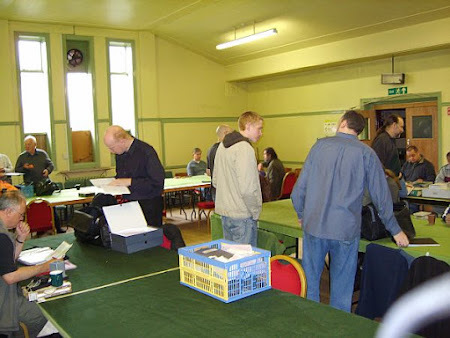 As I’ve said earlier playing in a closed group can stifle your understanding of any rule set so we signed up for part of the Northern DBM Doubles League (now with added DBMM & FOG for 2008) held at the MAWS club in Walkden, Manchester. It started at 10:00 am which, with the travelling involved, came as a bit of a shock to the system. 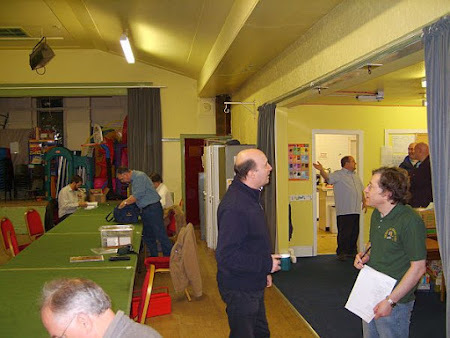 The first photo shows Bill Skinner (left) in conversation with (Geoff Pearson) in the foreground with my jacket and red toolbox just visible on the floor to the left of Bill. I was drawn on table 3 of 5. The start of the competition was reasonably subdued so I don’t think I was the only one who wasn’t fully awake. Finally, we all began to settle down and deploy for the first game. Most DBMM games were well under way by 10:30 and all were finished 3.5 hours later. The second game of the day started around14:30 once the draw had been completed and people had taken time for lunch and some fresh air. The day finished for me about 17:00. Game #1 against Gordon Harrow who fielded an all mounted Gaznavid army with separate army baggage. A close game which I won 17-8 plus 6 bonus points for beating a class one army. Beginner’s luck I think. Game #2 against Brian Pierpoint who fielded an all mounted army of Teutonic Knights again with separate army baggage. A stand up fight which I lost 21-4. Damn the dice! My scores were 28-10 and 5-27 respectively. 33 points placed me 7th of ten players. My mate, Graham Hutchinson, came 4th with 39 points. On reflection, I’m pleased with my first competitive outing. The difference in the scores above is because the latter are BHGS scores (max 32 plus bonus points) whilst the former are based on the DBMM system (max 25 plus bonus points). Complicated or what? Overall, I learnt a lot and I’d like to thank Gordon and Brian for being patient with me. Next time I’ll probably change the deployment of my bill and bow when facing knights. I used the bill in front in both games which worked well against cavalry and light horse but not against the knights. The bow would have fared better against the knights with their ability to shoot during the approach and count as overlaps when in combat. Finally, I learnt that befuddlement is quite common. Also I realised that the grading grid I produced in 2007 isn’t the easiest thing to refer to in a hurry so look out for a revised version in the next week.